Backlinks are the backbone of your website – the stronger they are, the better the position of your website. However, even the slightest change in your backlink profile – like the link disappears or a malicious one being added without your authorization – can dramatically affect your SEO efforts. Basically, if you are not in constant view of what is happening with your backlinks – once the front door closes, your pets (a.k.a. the backlinks) can behave like unknown creatures. Let’s take a look at what might happen to backlinks and what you can do to get them to behave like good puppies. Many things can happen to your backlinks without you even knowing about it and destroy the perfect SEO life your website has been enjoying. A cute little bunny might not be that cute after all. There are links from resources that might be reputable and respectable but get hacked at some point with many malicious links added to their profile. This change can affect your site as well. So don’t believe those blue innocent eyes – check them out. This dog looks almost like a cat but not the cat, however. Sometimes the link looks OK, but produces no results. That might happen when an extra dot accidentally is added to the URL or the dash gets spacing. Even a little change like that completely messes up the link breaking it out. Check the resources you got the link from to make sure no new animals moved to the page address. I’ve got a rival, what? Remember when Duke moves in with Max and takes over his life? The same applies to your competition. Watch your competitors – and their backlink profile closely because that’s what they do as well. The least damage that they can do is copy your actions. The worst, on the other hand, is negotiating with the publisher to replace the mention and a link to your site with their own, or luring away the influencer you’ve been successfully working with before. Was there a loving puppy owner in the first place? You may have had the nicest relationship with your resource owner, who had promised you all the goodies in the world but failed to fulfill them leaving you empty-handed – with no link – on the streets. So, if you have an agreement, make sure that the link is properly placed and that it works as intended. The bigger the website and the business is, the more backlinks it collects, therefore the harder it is to be in control of where the links come from, who got them, and how they behave and perform. And that leads to dark situations that might end up even worse if you don’t point the flashlight in the right direction. So what can you do to get back in control of the situation and save yourself from unpleasant surprises? In order to tame your backlink pets, you have know what’s happening to them at all times. Because it’s virtually impossible to monitor the backlinks manually, you need to pick an instrument that will provide you with detailed information about what’s happening with your backlinks at any given time. 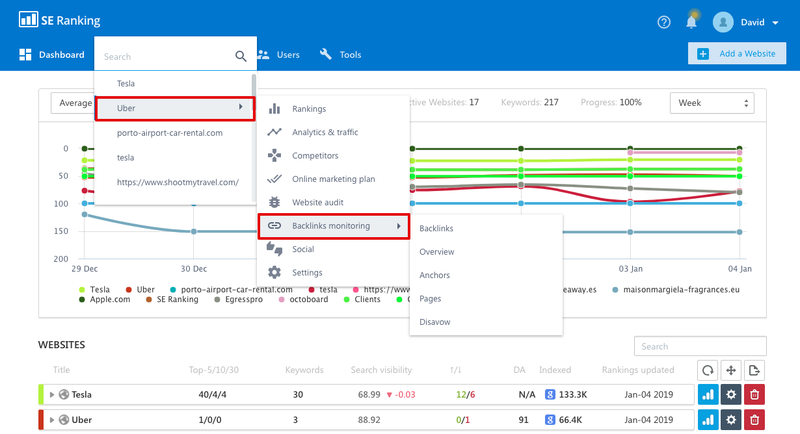 Let’s take a look at how you can check and monitor your backlink profile using SE Ranking’s Backlink Monitoring. This tool can be found in the drop-down list of the instruments in the project tab. You can import the links for the project manually one-by-one, as a list in a text file, or directly from Google Search Console. Uploaded links are then further inspected in terms of the link status, whether it’s been indexed or not, whether it’s nofollowed, what the anchor is, and so on. This comprehensive view helps make educated decisions about what to do with a link, how it’s performing, and what to prioritize. 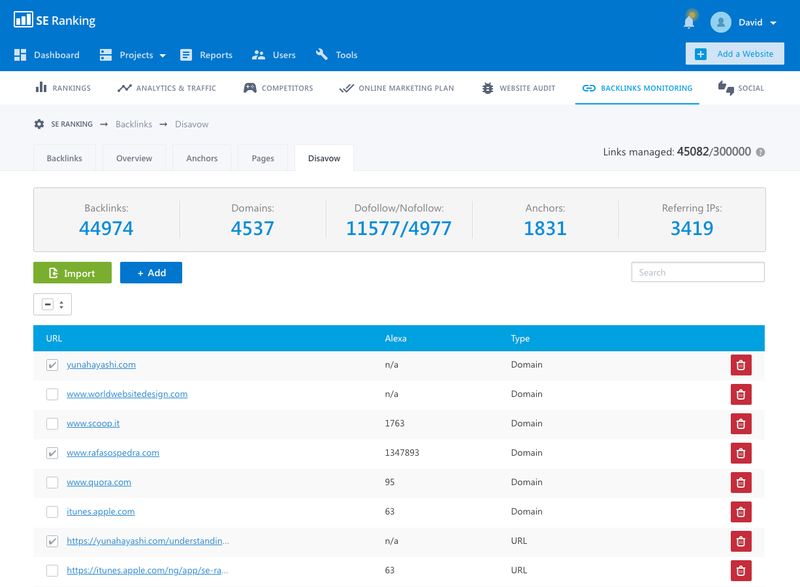 For example, if you were checking your backlinks and discovered that some of the links you have earned on trusted platforms are broken, you can contact the resource and correct the link or replace it with a better alternative. In addition, you can adjust your strategy by evaluating anchors and checking whether they reflect your prioritized categories and/or keywords. You can also mark your links by adding notes to them: category, price, validity period, who placed it on the site, and so much more. 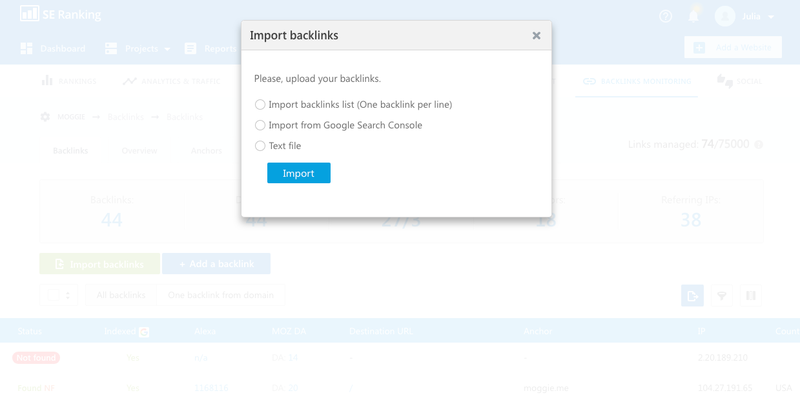 If you are working with a large volume of backlinks you can disavow links in bulk. Simply mark the ones that you want Google to disregard and SE Ranking will generate a disavow file automatically. It’s also important that you evaluate the link when it’s placed as it will show you how quickly the link profile was built, and how often the links were updated. If you have an aggressive promo strategy, this data will help you create a more accurate timeline while aligning your SEO efforts with the global marketing strategy. Regardless of whether you are doing SEO or trying to figure out what’s wrong with your fluffy companion, the sooner you discover the problem, the faster you can evaluate the situation, find a solution, and eliminate the cause of it. So, once again, monitor your backlinks to have access to quick problem diagnostics and immediate response to the problem, using it as a solid base for your SEO strategy or for better backlink management. Backlinks are a valuable asset to your business so make sure that you are constantly monitoring their well-being. They do tend to behave like unwatched pets so make sure that you are shielding yourself from any kind of unpleasant surprises. You can see for yourself how SE Ranking Backlink Monitoring works by subscribing to a free trial. No commitment, no credit cards – just your website, your backlinks, and a look into what you might have missed by not having your backlinks under your total control.